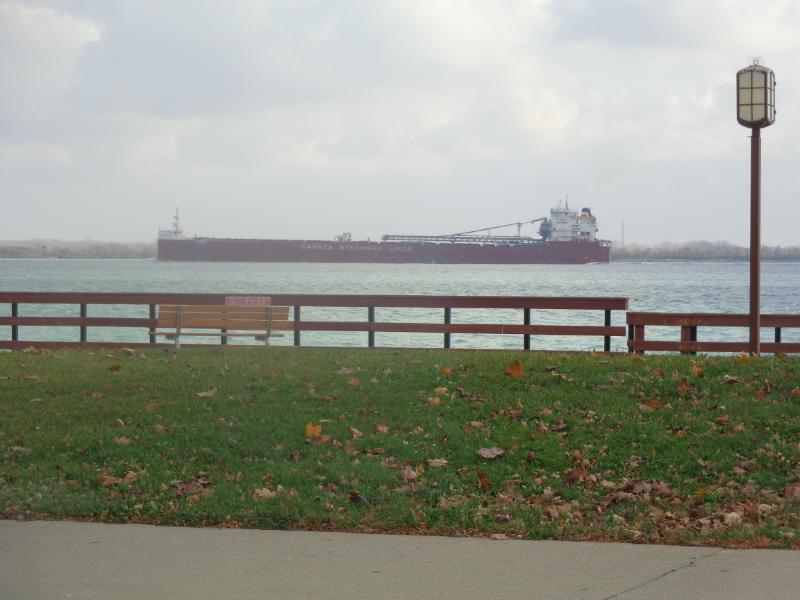 If you have ever taken a stroll along the water’s edge in Wyandotte (as pictured above), or even on Detroit’s own Riverwalk, you probably will not have to wait too long before a freighter appears on the horizon. Soon the shipping season will come to a halt once the waters freeze over and the freighters that sail the Great Lakes will cease their travels until the shipping season opens again in late March. You don’t have to be interested in admiralty law, or even be in the maritime business, to recognize the beauty of these large freighters and realize the enormity of the valuable cargo they transport. Anyone can appreciate their size and their competent crews who ease them through the sometimes turbulent waters. This freighter from the Canada Steamship Lines seen above is a little nondescript and blah looking with its rust-colored hull. Even the weather that day was a little blah – a gloomy and gray November morning, much like today, when my friend Marge Aubin and I took an impromptu trip to Wyandotte for a gab-and-photo session. While we snapped shots of seagulls swooping too close to people strolling at the water’s edge, or fisherman reeling in their catch of the day, this huge and hulking freighter suddenly came gliding along changing the view of the horizon. At a glance, that freighter pictured above could be the “S.S. Edmund Fitzgerald” – the colors of the hull and topside are very similar in appearance to that doomed ship. I’ve mentioned before that I’ve been on freighters several times when they were docked and unloading at the cement silo in Detroit because my boss has a client with a small fleet of vessels. I was in awe the first time I ever boarded a cement-hauling vessel that was just as clean as a cruise ship – in fact it took on paying passengers who wanted a glimpse of the Great Lakes while sailing aboard a freighter. And looking at this picture today, I am reminded of our trip and the many freighters I’ve seen gliding through the Detroit River over the years. But one freighter in particular comes to mind today – “The Edmund Fitzgerald”, because it is the 40th anniversary of the ore carrier’s demise. There’s been a little more commemoration today, than the usual remembrance of its sinking, to mark this 40th anniversary. I’m sure most everyone in Michigan is familiar with the event as well as Gordon Lightfoot’s subsequent tribute song “The Wreck of the Edmund Fitzgerald”; in fact, for most people, they need only hear the first few strains of that song and will recognize it instantly. It will make you think back and remember what you were doing on that fateful day. I know I was a student at Henry Ford Community College and on the staff of the newspaper “The Ford Estate” – I recall how we spoke in hushed tones about the tragedy the following day. We all came to the same conclusion … that it seemed impossible a vessel that size was gone without a trace after gale-force winds swept it from the water. It seems inconceivable that Mother Nature could wreak such havoc to destroy men and metal, leaving only memories in a matter of minutes. We will forevermore mark this sad anniversary and remember the 29 crew members who lost their lives that day in special ceremonies at the Mariner’s Church in Detroit. Today there was a special commemoration service in River Rouge where the “Edmund Fitzgerald” was built. 40 years and still remembered with awe. That was a big ship and many men went down with her.I hope they are remembered as solemnly as the ship.I do remember that little trip we took. Nice picture Linda. I came back here tonight to read some of the recollections of the tragedy – I watched a video of the ship shortly after it was launched in 1968. Glad you liked it Marge. I’m glad you liked it Ann Marie – I was at HFCC and got my Associates Degree there, then transferred to Wayne State after that to complete Bachelor’s Degree. I loved that song as well and back when it came out the year following the tragedy, it seemed you could not turn on any radio station without hearing it. Listening to it the other night, I remembered all the words. The picture was from right along the river in Wyandotte … I had a more close-up picture but liked that one as it showed the walk along the River and the crumpled-up leaves. They might be running those freighters longer this year since we are expecting a milder Winter – I heard on the radio this morning that the Coast Guard says even the freighters have some difficulty navigating the waters – doesn’t surprise me due to the “Edmund Fitzgerald” and also the “El Faro” which sank after Hurricane Joachim. Mother Nature sure doesn’t fool around sometimes – she means business!